A dental abscess is an infection caused by bacteria. Usually, it appears in an infected tooth, with a large cavity, or some kind of dental damage like in a cracked or chipped tooth. Once there’s an opening, the bacteria can easily access the inner parts of your teeth. The infection can spread from the root of the tooth all the way to the jaws. In severe cases, the person may experience additional symptoms such as fever, nausea, draining pus, vomiting, and chills. An immediate dental treatment is highly required when the upper or lower jaw has become swollen. If the swelling caused by advanced infection occurs, blockage of patient’s airway may happen, and an emergency room treatment will be needed then. Poor dental hygiene is the most predominant cause of dental abscess. It also involves your excessive consumption of sugary or starchy foods. 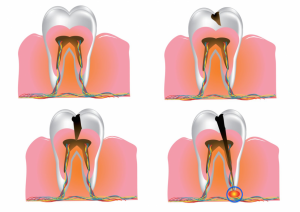 Trauma to the tooth, and the existence of a large tooth cavity are also known to be common causes. You should also be aware that periodontal pockets from gum disease could cause a dental abscess, as well. Practicing good oral hygiene reduces the risk of having a dental abscess. Nevertheless, having this kind of condition creates a great discomfort that affects the quality of your life. To properly deal with your dental abscess, consult us here at Precision Dental. Your trusted Brisbane Dentist is committed to providing you with high-quality dental treatments that help you overcome your dental and oral health concerns. Call us today on (07) 3852 1160 or book an appointment online.